Gallirex johnstoni Sharpe, 1901, Ruwenzori Mountains, Uganda. Two subspecies. 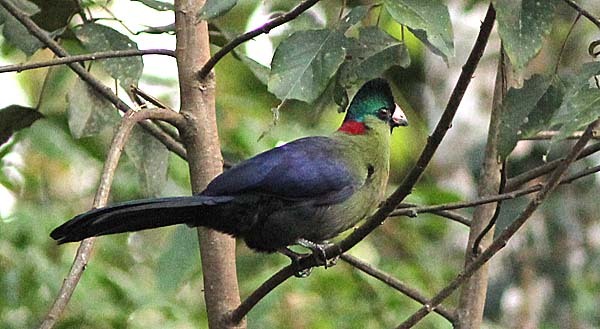 English: Johnston’s mountain turaco; French: Touraco du Ruwenzori; German: Kammschnabelturako; Spanish: Turaco del Ruwenzori. 17–18 in (43–46 cm); 8.2–8.7 oz (232–247 g). 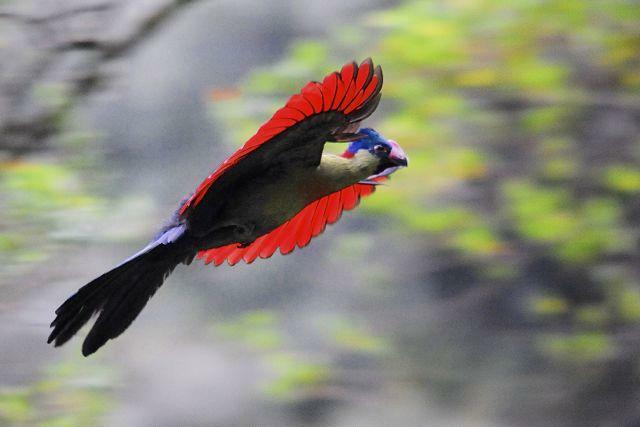 A brilliant green and violet blue turaco with red primaries conspicuous in flight. 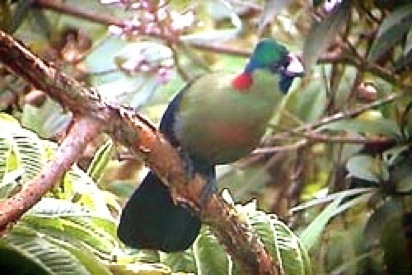 Short glossy green or purplish blue crest on hindcrown; nape dull crimson, chin and throat blue black. Distinctive peachyred patch on an otherwise green breast; wings and tail deep violet blue. Shape of bill highly distinctive with a rounded culmen rising to a narrow bony ridge between the eyes. Eyelids scarlet surrounded by highly variable loral areas; these being emerald green and fully feathered in kivuensis, but simply bare yellowish skin with some pinkish red below and behind the eyes in nominate birds. R. j. johnstoni: Ruwenzori mountains and at Mount Kabobo (Dem. Rep. Congo), where originally described as T. j. bredoi. R. j. kivuensis: Montane forests of the Itombwe and Kivu Highlands (Dem. Rep. Congo), Virunga volcanoes, Nyungwe Forest (Rwanda/Burundi), and southwest Uganda. 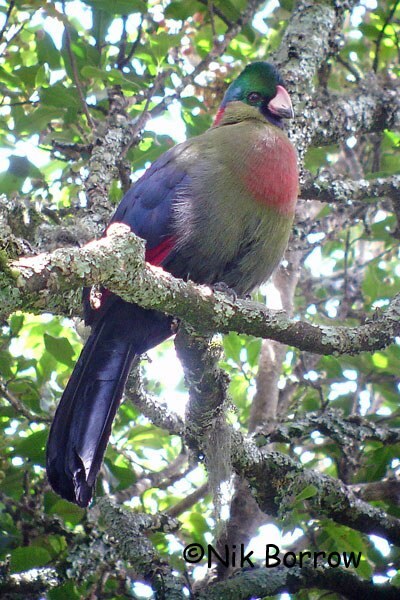 Endemic to high mountain forest between 6,500 and 11,000 ft (2,000–3,400 m) on either side of the Albertine Rift. Occurs in pairs or small family groups, with many individuals remaining paired and aggressively defending territories throughout the year. Particularly favors the bamboo zones and areas dominated with epiphytes and lianas. Eats primarily fruits and berries, but large quantities of leaves and flowers are also consumed. 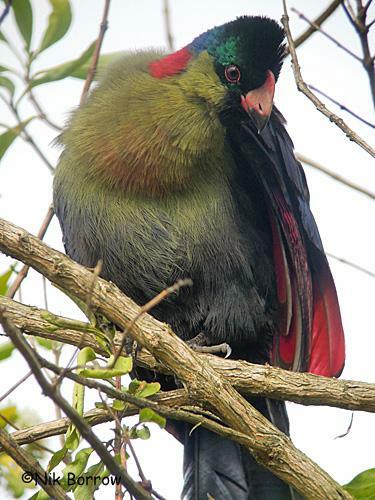 Where sympatric with the great blue and black-billed turacos, all three species can frequently be found feeding alongside each other in the same fruiting tree. One or two dull grayish-white eggs are laid in a nest that is little more than a small platform of sticks, generally 10–15 ft (3–5 m) above ground in a bamboo thicket. Incubation and fledging periods for this species remain unknown. Not globally threatened, but with continuing habitat degradation as a result of prolonged civil unrest throughout its restricted range, it remains a species in need of constant monitoring. Although no trade reported in this species, it has long been hunted for food in the Democratic Republic of Congo.